I was invited by the very lovely Anna Brown to participate in the Sunshine Blogger Award. It’s a nice little tag post where someone asks you 10 questions, which you then answer and nominate 3 more bloggers to answer your own 10 questions. It’s a nice way of shouting out to other bloggers you like and learning more about them. 1. If you could visit any point in history for just an hour where, when and why? Okay this is overly sentimental, perhaps, but give me a break – I’m still in grief mode. I would go back to Florida in Summer 2003, when I was living with my grandparents. I would sit my grandma down and ask her all of the questions I never got to ask, and tell her the things I never got to tell her. 2. What film does everyone else love that you think is totally overrated? Does it have to be a film? Because the thing that really fits this question for me is Breaking Bad. Everyone thinks it’s so great, right? I tried really hard to watch it, but it just sets my teeth on edge. I had nightmares about the episode with the bathtub. If you’ve watched it you’ll know what I mean. But I do like that joke that went round, about how if Breaking Bad took place in the UK, the whole story would never have happened because the NHS would sort him out for free and he wouldn’t need to sell drugs. 3. If you were a cocktail what would your ingredients be and what would you be called? This is a really hard question! I’m no mixologist! Can I be a drink that already exists? I would be a bourbon sour, because it’s classy and complicated but not up itself. Also, it’s American but slowly becoming more accepted in the UK. 4. What five items are always in your handbag? Besides the obvious wallet, keys, etc., I assume? Too many pens, an emergency sanitary pad, headphones, lipstick and business cards (two types – one for blogging and one for my day job). 5. If you had to lose one sense, which one would you choose? Hearing because I think you probably lose the least amount of quality of life. You can still drive, see where you’re going, look in the mirror (I’m vain like that), unlike if you were blind. I love to eat so I don’t think life would be worth living without a sense of taste, and your sense of smell is linked to taste. And life without touch would be very lonely. I’m already losing my hearing anyway, I think, from listening to too much loud music as a teenager. 6. Have you ever broken the law? Details required unless a court case is pending. When I was about 12, I stole some sweets from a store because I really wanted them and didn’t have any money. I felt so guilty that I went back the next day and left the money on the counter before running away. I’m such a rebel, right? 7. How do you de-stress? I could probably make an argument for running or even blogging, but let’s face it: it’s wine. 8. If you could only eat one meal and drink one drink for all eternity without negative repercussion what would they be? Does that mean I could only ever eat that thing, or just that I could eat as much of that thing as I want? Anyway, I reckon it would be a spicy chicken tikka masala with some vegetable sides, pilau rice and naan bread, with a Strongbow cider. If it’s a full meal, I would require poppadoms with chutney beforehand and cupcakes for afters. Really moist and spongey cupcakes with lots of icing on top – American ones, not stodgy British ones. There are so many places I’d like to go, but my big dream is to go to India, with a mixture of sightseeing and relaxing on a beach in Goa. A week might not be enough. I would either go with my partner and not my kids, or maybe take them when they’re much older than they are now. 10. Tell me three things that make YOU wonderful. I’m honest, loyal to my friends, and good at spelling. What’s the farthest you have ever been from home? If you could have one day where there would be no consequences for doing socially unacceptable things (not necessarily illegal – just rude), what would you do? What is one song that would HAVE to be on your life movie’s soundtrack? What is the number one thing on your “bucket list”? What is your favourite conspiracy theory, that you really hope is actually true? Would you rather travel to the past or the future, and why? What is your favourite word? Mine is defenestrate. Name 3 things you are grateful for today. 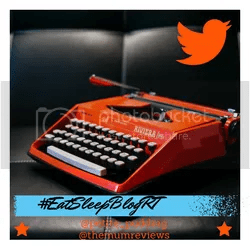 Welcome to Week 9 of #EatSleepBlogRT! It was a really busy week, as you will see from my host post, but I really enjoyed reading all your posts as a way to unwind on Friday night. I’m a little late adding this post and Zoe’s post is missing this week due to her wifi being gone for her impending move. Life never stops being interesting! The winner of Top Post is Lisa Pomerantzster, “Swimming upstream. The world can be a pretty mean place sometimes, but it’s nice to be reminded that it’s right to keep on standing up for ourselves. Top Tweeter was Laura from Five Little Doves (@fivelittledove5). And incidentally I really loved her post this week about CBeebies Land. I’d been wondering if it was worth going and she makes a good case. 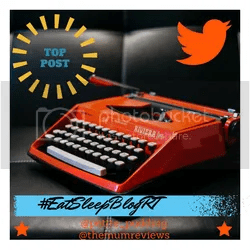 Welcome to Week 8 of #EatSleepBlogRT! Thanks for everyone who joined us last week. It was a great group and very hard to choose a top post among so many great ones! The winner of Top Post was Miss P Meets World, “ “What’s in our baby keepsake box?”. This made me all emotional and nostalgic about the little things I have that remind me of when my babies were very small. They really do grow up too fast. Are you good at letting go of sentimental things to avoid clutter? I definitely am not! I’m awarding Top Tweeter to The Frenchie Mummy (@FrenchieMummy) this week. She made a really great effort in tweeting out lots of posts. When am I going to drop a plate? I have had this post title, ‘When am I going to drop a plate’ in draft for months – probably since shortly after I started this blog last July. What do I mean by dropping a plate? Running around, trying to make sure all the plates are balancing on all the sticks. It’s impossible to be everywhere at once or to keep the plates spinning forever. Sooner or later, one of them is going to fall. Even more likely: they will all come crashing down at once. I have felt like I’ve been coasting along keeping the plates spinning for quite a while. But all the time with a sense of foreboding that I couldn’t keep it up forever. And perhaps unsurprisingly, this January has been accompanied by the jangling of smashing crockery. I was staying healthy, but now I have the flu. I had a flu jab, but I still got the flu. I was keeping up with work at my day job, but now I’ve missed 3 days in a row from the flu, so cue the overflowing inbox next time I have the strength to look at it. I was keeping the house tidy. Now it is not tidy. I was keeping up with the blog. Now I’m struggling to write anything or find time to promote it. I was staying positive mentally. Now a beloved relative is very unwell and I can’t help but dwell on that. Even though my being upset will do absolutely nothing to change it. I’m just about managing to keep the kids alive and happy. That’s the only plate that is never allowed to fall. What do you do when your plates come crashing down? I’ve been limping along, pretending they’re still spinning, doing the bare minimum of everything just to get by. Then when the bug hit, I let them fall. I was relieved for an excuse to lay in bed for 3 days straight (at least while the kids were at school/nursery, that is – not everyone has that luxury). How do you get some new plates and start them spinning again? Do you focus on one at a time until you can slowly build back up to the full performance? Do you hoist them all up again with one herculean effort? Do you sweep one of the plates under the carpet and pretend to forget about it? The plate that would be forgotten, swept away, and never replaced would have to be the blog. I’m not allowed to give up on working or existing. I even (vaguely) need to keep my house tidy. But I’m not one who easily lets go of things. Whether that’s a good or bad quality – it’s difficult to say. It makes it harder for me to accept that things change. But it might just help me keep going when I feel like quitting. So I’m going to focus on one plate at a time for now. Tonight I’m hoisting up the blog plate with this honest post about how hard it is to keep going sometimes. This weekend, I’ll look after myself, my house and my kids. On Monday, I’ll tackle those work emails. And I’ll forgive myself for all the broken plates. Because none of it would be worth doing if it was easy. And gravity catches up with us all. 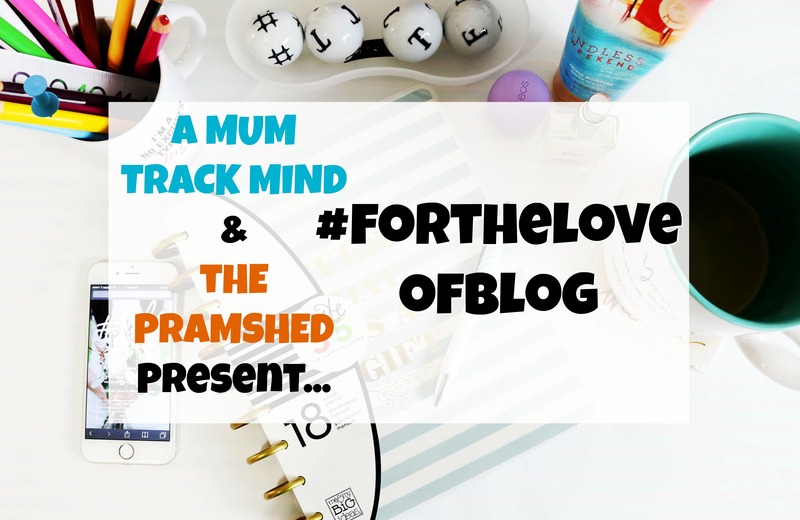 Author The Mum ReviewsPosted on 26/01/2017 28/01/2017 Categories Family healthTags Blogging, dealing with a busy life, dealing with stress, how to get it all done, managing competing priorities, parenting is difficult, the busy life of a mum blogger12 Comments on When am I going to drop a plate? If you don’t try, you can’t fail…? I’m the sort of person who would rather leave things to fate than really try for something. It’s easier to quietly hope for something than to go out there and really try. If I don’t try in the first place, then I can’t fail! So I am doing something that scares me now. I’m going to go ahead and ask that if you read this blog, could you – pretty please – drop me a little vote in the #tribalchat awards? Tribal Chat is this awesome community of bloggers of which I’m a part. We have a Twitter chat once a week and all support each other in a Facebook group and across social media. Three times a year, they do a little award ceremony where people can vote for different bloggers who they think are doing well in particular areas. I started blogging to challenge myself to get out of my comfort zone. Asking for your vote is totally out of that zone! There are loads of different categories you can write me in for. You can write The Mum Reviews in up to 3 categories, but any more than that and your vote won’t count. I’m happy for you to choose what category you think my blog most fits, but if you want a suggestion, I’d be keen on Rising Star, Kindness or Social Butterfly. Rising Star because I went from 100 to 2600 Twitter followers in 6 months. I think that’s pretty good going. Kindness because I help other bloggers learn how to do blogging stuff. Social Butterfly because I have a good #tribalchat attendance record and am always up for some wine and a silly GIF. Please CLICK HERE TO VOTE. Remember to vote for me in no more than 3 categories. You don’t have to fill in all the categories if you don’t want to. Author The Mum ReviewsPosted on 03/01/2017 04/01/2017 Categories NewsTags blog awards, Blogging, if you don't try you can't fail, self promotion, tribal chat, vote for me14 Comments on If you don’t try, you can’t fail…?